9hrs 15minutes of eyeballs out racing, approximately 10 minutes of standing almost still in transitions, 162km, 9300 calories, 2500m climb, Scotland Coast to Coast. 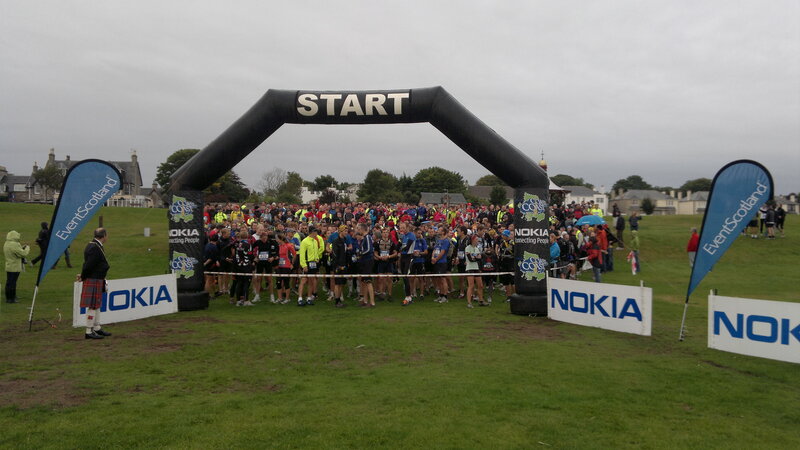 I had arrived on Friday to Nairn, and spent a few hours chatting to some of the Nokia guests about the course; they were all doing the Challenger class, 160km over 2 days. 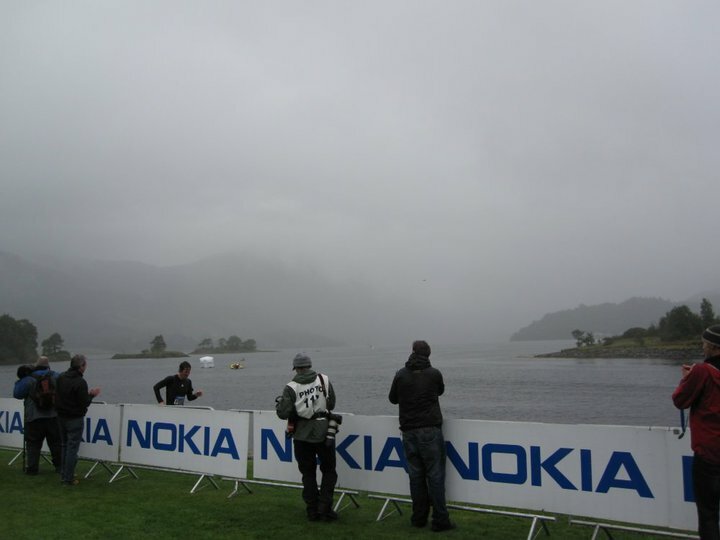 A huge challenge for most people, especially when the weather was as bad as it was; wind, rain and cool temperatures. I got up early to watch the start on Saturday to say good luck to all my friends racing, and to check out how it would all work the next morning. It seemed like a good idea at the time, but I would have liked some more sleep I think! The start was great though, seeing so many people set off, some at a fast pace, others at a rather more sedate pace, but all out there to take on the course laid out ahead. I sorted my new brand spanking new bike out, a Boardman cyclocross, and put the road wheels on. A simple task made difficult as the rear wheel wouldn’t fit,so had to just go with the front. I then decided to ride out to Cawdor Castle, to check my bike was all ok and that the set up was right (I had only got it the week before…! )It all seemed to be fine, and it was good to spin the legs out ready for a full day of racing. After chatting with some friends, picking up my surfski from Ant Emmet, and buying some last minute items for the big day we headed back to the hotel to find somewhere to eat (again!). Nairn is a pretty small place though, and the only Italian restaurant told us they were fully booked. Clearly all the other racers were after some pasta… So the hotel it was, and Ant Emmet, Marty Lee and Becs McPherson joined us for some food too (although we decided to limit the racing chat about the course!). After heading to bed, I got a message from Ed Coats looking for a floor – after walking to the South Pole you clearly can sleep anywhere! He finally arrived and we had some good banter before getting our heads down for the few hours sleep we’d get before my alarm went off at 4.45am! As morning came around way too soon, I got up and kitted out, and ran down to the start to warm my legs up a little. It was an odd scene seeing all the support vehicles with fast kayaks sat on top of them in the dim morning light. I knew a lot of the people racing, so was good to have some pre race banter in the cold before we lined up for a pre race briefing from Gary. At 6:14am we started, and into a stunning sunrise we headed off at pace to Cawdor Castle. With the sun turning the trees red along the river bank I chased after the 2 fast Kiwi boys ahead of me, thinking that it was an almost impossible task, (one guy had won the London Duathlon the previous week), but as we neared the castle I was pulling them in, as track had got muddier and more technical. This gave me a great boost as I was thinking that they would struggle on the final big run. First transition at Cawdor Castle. Into the transition I was really focused. I’d told Jane that I intended to be in and out in about 60seconds at each transition. I went through in my head what I needed and wanted, so as soon as I arrived I changed shoes, put my helmet on, shouted at Jane to do this and that, and then ran off across the muddy field to jump on my bike. I’m not sure how long I’d been, but it was fast, and I left just after the 2nd Kiwi, so I was happy with that. However, he had a time trial bike and aero helmet, so as soon as we hit the open road he was off and there was nothing I could do. 1km down the road the route carried on along a wee side road, and JJ Wilson (the Kiwi) for some reason missed the 4 arrows and followed the road round to the right. He was too far ahead for me to do anything, so I just blasted on, wondering if I should have done something, but if he couldn’t look up and read the arrows then it was fair game. I pushed on hard, knowing I was going to lose time to those on fast road bikes.Although I only had one road tyre on, I felt like I was moving pretty quick. About 15minutes in Sean McFarlane (4th) came past me and as I tried in vain to stick near him I got my head down to grind out the miles. Having studied the route a lot I knew where I was most of the way, and was happy when the loch came into sight and then the fast twisty decent down to Loch Ness. The signs down to the kayak were small, but obvious enough if you’d done your homework. Those hours in front of the course map were coming to good use. At the kayak get in I threw my windproof on as I was pretty chilly after the ride, and then ate some Ambrosia creamed rice (tasty for some!) and jumped into the kayak and headed off to chase down the guy in front, thinking I was in 3rd place. John Laughlin had told me I was 9 minutes down, but hadn’t mentioned 2 people ahead, so I was wondering what had happened. I got round the headland and was still upright in the cross waves, and as I headed south down the loch I could see the man infront. I kept a good rhythm up and concentrated on just getting to the end. This was going to be my toughest section and I had to minimise any losses. After a short while I glanced left and saw James Block, ex GB marathon kayaker, come past me. I again gritted my teeth and tried to hang onto his coat tails. This was never going to happen, but it gave me the fight to keep pushing when I was really starting to tire. Finally I passed Sean and asked if he was first on the water…he told me he was, so I wondered what on earth had happened to the leading Kiwi racer…? After what seemed like forever the end came into view, Chris Gazely’s giant yellow van stuck out at the head of the Loch, I put my head down and went for it, just keeping James in sight ahead, and holding off any attack from behind. Getting out was a huge relief, I’d started to lose my technique due to fatigue, and Ant Emmet was just behind me. A short run to the bikes got the legs loosened up and after another speedy change I was ready to go. I’d had a few issues with my bike on the first leg, but Johnboy had been a hero and helped Jane get it all sorted, and Dave MacFarlane had chipped in too, so huge thanks to you all! The ride started off along the tow path by the Caledonian Canal, this was super fast, but very wet and muddy. The CX bike was amazing. This was the first time I’d ridden off road on it, and I felt like I was flying. I didn’t look back to see how Ant was getting on, short of shouting some encouragement just as I got onto my bike. This bike section was 55km, and a lot of it was off road. I knew most of that off road was on wide forest tracks, so I was a bit surprised when all of sudden I hit some lovely rocky singletrack. On my mountain bike I’d have flown along this, but on my CX bike it was a bit of a bone shaker, but I was amazed at how well the Boardman took me over the rough muddy slippery terrain. There was a short road section over a bridge, then back onto the fire roads, it was here that I finally caught James Block, I passed him feeling really strong so I rode on as hard as I could, keen to make as much distance between us for the final kayak leg. Soon after passing James I started to pass some people on the 2 day challenger class. I was a little surprised to see them so soon, but it was a great boost to me to keep pushing. Fort William seemed to take forever to appear, and I was very relived to finally see Cow Hill up ahead. My London cycling came into play on the way into Fort William, there was a long queue of cars trying to get past some slower cyclists, so I sped past on the outside, keen to get as much time behind me as possible. Everyone knew that this next section was where the race would be won or lost, the other parts were just getting to here. I was really focused on a good transition, and really keen to get out as soon as possible. I had some great support while I was there, Mack and Tom from Threshold Sports cheered me on, as did some of the Nokia guys who were racing, it was great to hear, and really spured me on, and it was hugely appreciated, even if I didn’t acknowledge it at the time. The run started with a road section, I was really tired, but knew that I had to run as much as I could. Everytime I started to walk I told myself that others would be running, that I had to push hard. The climb up the side of Ben Nevis was ok, I got my legs going and felt good. The steep decent to the youth hostel was tough and slippery but I was confident in my running on such terrain. Hitting the West Highland Way was going to be tough, a long gradual climb on wide forest tracks, all of which was runnable. I kept going as fast as I could, looking over my shoulder every now and again, getting some great support and cheers from people in the challenger class when they realised that I was leading the expert class. The run felt like it went on for eternity. I was just hanging out till I got to the turning point at the ruined Lairigmor Croft. From here there was a steep climb and I knew everyone would be walking this. They had to be, I was in pieces, starting to cramp up, feeling hungry and tired, but struggling to eat, focusing on getting to the coll and down the other side. Once at the top I raced hard to the bottom, keen for the race to be over. The decent was pretty sketchy though, really wet slippery grass, I managed to stay upright, but watched many other people sliding down on their bums. I reached the road after a 15minute decent, and Johnboy was there waiting for me, I’d said I’d be about 2hrs, but that was maybe a bit keen, and had taken 2½, so everyone was wondering where I was. I then had a 1.5km run along the road, my legs were in agony. John was shouting at me to go faster, telling me the transition was really close, I could see it up ahead, could see the support crews waiting for me to arrive. This was it, I was almost at the end, one final paddle and done. Jane was all set up again, everything lined up ready for me to go, not a second lost. Jane had been amazing at this all day. I gave it everything, still super focused on the transition, leaving nothing to chance. I had not known how much of a lead I’d had since passing James on the bike section which was worrying, thinking they may be just behind me, ready to pounce on the last kayak leg. John told me there was no one behind me as far as he could see as I set off in my boat. The loch was stunningly calm, and it made for a lovely paddle. John had told me to go to the right of the islands, but then I didn’t know where next. When I rounded the island I realised I needed to keep going round the headland, and paddled hard, not because of being caught, but my legs were about to cramp, and I didn’t want to swim this late on! Gary Tompsett was waiting at the landing point to help me in and congratulate me, and send me off on the final 300m run around the headland. This was super painful, my legs were in pieces, and as I glanced at my watch I thought about trying to get under 9hrs 15mins, but that soon evaporated. Dropping down to the waters edge I could see the finish. All of a sudden my body felt light as air, nothing hurt any more, I could run freely. I heard the cheers start, and started to relax, I’d done it. 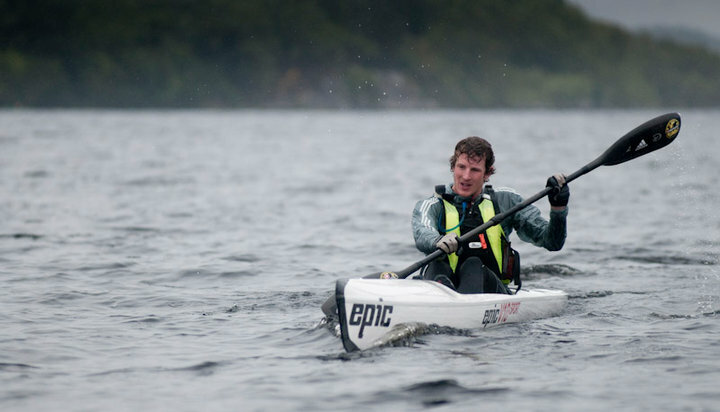 Raced for 163km, running, biking and kayaking from Coast to Coast. Crossing the line to the applause and cheers was amazing, I’d been focusing on this all day, and to cross in first place was amazing. 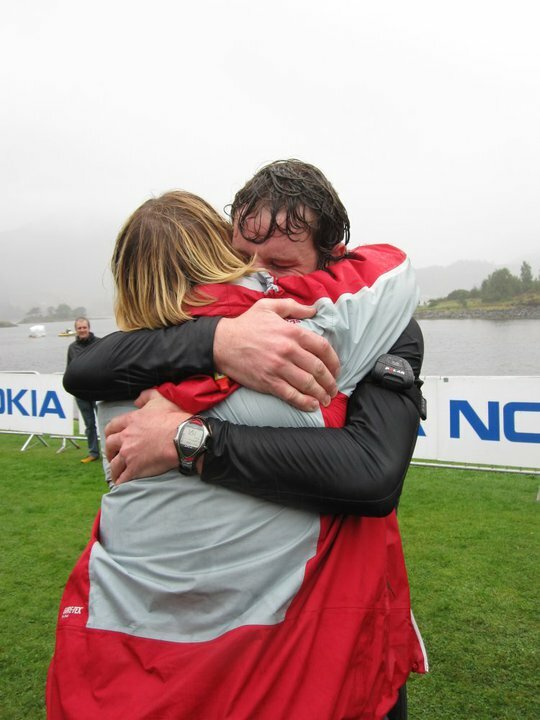 Jane had made it around from the kayak transition in record time, and Andrew her brother was there .he’d raced the 2 day event, finishing a brilliant 27th on his first ever multisport race). Jon and Audrey (Jane and Andrew’s parents) were there too, so it was fantastic to celebrate with them. 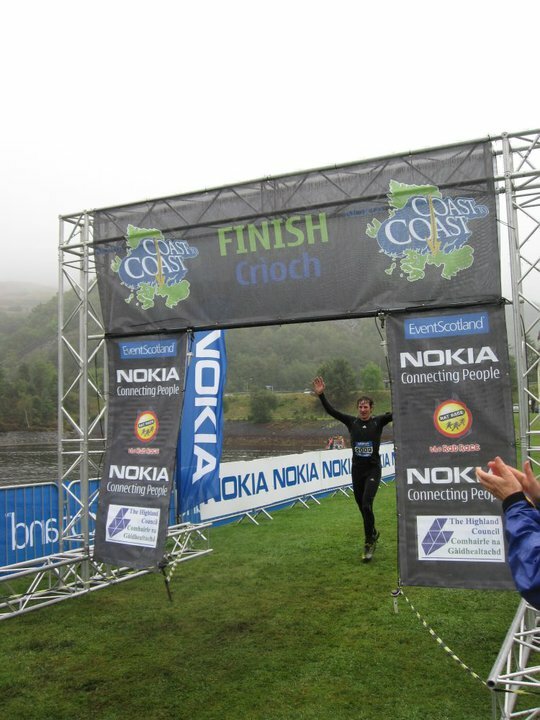 I was pretty emotional at the finish. My face might not have looked it from the video clip, but I was close to tears. This had been a huge race, really tough mentally and physically, and to come through to win was just brilliant. I couldn’t have done it without Jane though, she had offered to help late on, and I don’t think she really knew what she was letting herself in for. But on the day I couldn’t have asked for a better crew. Every transition was pretty much perfect, if I asked for something it was there, if she couldn’t do it, she had got someone else to help her out. Just brilliant. 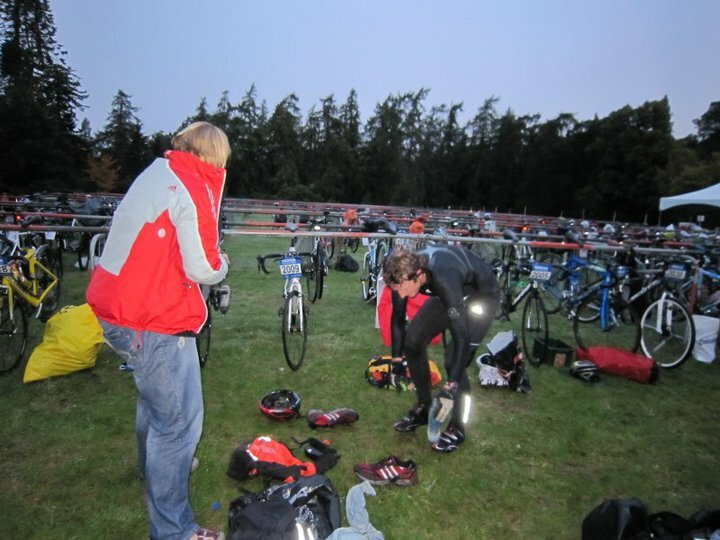 John Laughlin (who was supporting Thure and Peter from Denmark) was also a massive help, sorting out my bike, helping Jane out, encouraging me to go harder, and keeping me updated on times. Thank you. Dave MacFarlane, (who was supporting Ant Emmet – he’d been asked to do this on Friday!!) was a great help too. Thanks also to adidasTERREX for my kit, it was perfect for the race, I didn’t change kit all day! Halfords and Boardman for the CX bike, I loved it, and was really impressed with the handling off road. And OMM for a brilliant rucsac. Crackin’ effort, The Lad. I’m very proud.